Good Evening all, it’s Liza, the Owner of The Wandering Path. As the day is winding down I came across this graphic. 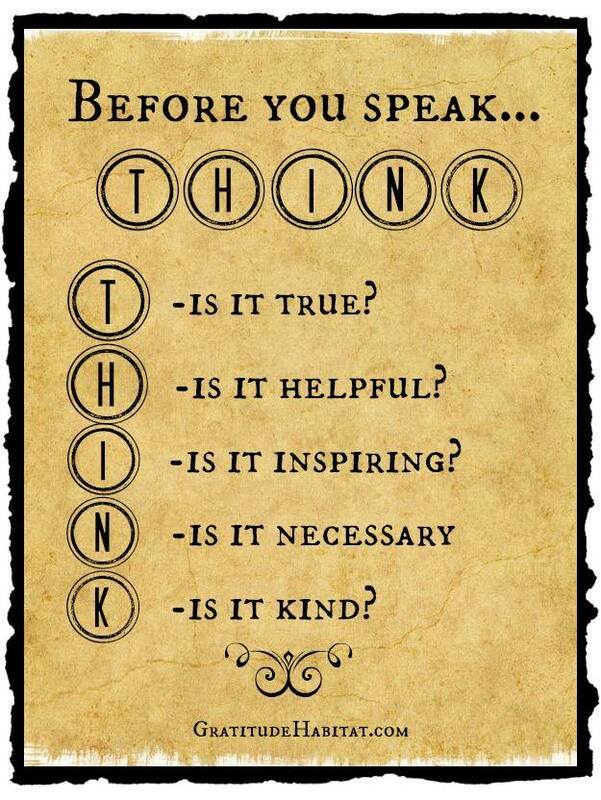 I know I’m guilty of speaking before “think”ing and so perhaps this graphic can be a reminder for you as well. I know I need to probably print this and put it where it can be seen every so often so my mouth takes that pause before it decides to just let loose. Blessed Be, Brightest Blessings, and Sweet Dreams –Liza M.
Good Morning to you all. We hope the hangovers are few and that you enjoyed yesterday. The Owner received an email from a friend yesterday. He told her that he hoped that her dream of making The Wandering Path a success works and that he was a bit jealous that she had the courage to do it. She thought about what he said, and yes she recognizes the risk she took in starting a business, especially one that is purely online to keep costs down. But…she explained that she thought about what the worst scenario. It didn’t work…okay, so she’d be on the job hunt which she would have had to do anyway once her sabbatical time was over..and she’d be out of some money…again okay..just means the stock would be the friends, family and strangers Christmas, Birthday, Anytime, Just Cause…gifts until it was gone. So…yes, she took a risk but one she felt she needed to. She believes in using herbal and natural remedies, that’s why she carries those. She believes that people should be able to make their home their haven that’s why she carries candles, lanterns, oil warmers. She believes you should be able to express yourself in whatever style you choose and that’s why she carries various jewelry styles that have some type of unique meaning or are just “cool”. She is a woman, and she does love handbags so yes, she carries them but she loves supporting cultural avenues and that’s why we brought in the hand-crafted items from Nepal. They are a great people and do beautiful work. Every item on the site is not chosen because it would “sell” it was chosen because it could help someone… somewhere…find overall wellness in their lives. Overall wellness to her means the mind, the body, the spirit and by appealing to all of them you can help manage the stress and roller coasters of life; and help someone find their own joy & calmness and a way for them to be themselves. Her last thing is pricing considerations…she likes to keep all price points under $20 because she wants it to be affordable. You want a garden, okay..you want aromatherapy okay..you want something to help your health..okay…but you shouldn’t have to spend so much money to get those things and even though our profit margins range from $1 and up on each item she just hopes that people understand what she is trying to achieve and that they can ask for things and she will try to locate them. Believe us, if she could give this stuff to those that need it for their own “wellness” she would. she has to stop herself from doing so quite alot…or we have to stop her. Okay enough babbling, thank you for listening. Her path is a search for Serenity and by owning The Wandering Path we have seen such a change in her already..she is calmer, happier, and looks forward to “work” every day even on days she wakes up on the grumpy side of the bed. BB to you on your Wandering Paths!